Frankie Goes To Hollywood ‘Inside the Pleasuredome’ fully funded! The ‘Inside The Pleasuredome’ deluxe box set is currently 103% funded after just 6 weeks. Here is an updated spread of the contents although some of these will change as we are still putting the finishing touches to the designs before going to press. You can pledge for a set or separate elements here. 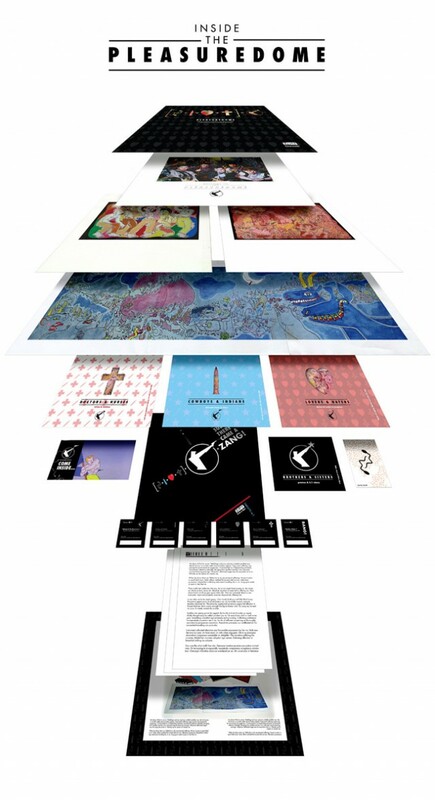 artist: Frankie Goes To Hollywood title: Inside The Pleasuredome format: Ultra-Deluxe Box Set design: Openmind & Philip Marshall after XLZTT illustration: Lo Cole cat. no: ZTIS 314 date: 29/10/2014 art of notes: This will be Element 38, some of the details and colours here are subject to change for the final product.